11:01 a.m., Jan. 13, 2012--Tai Liu, professor emeritus of history at the University of Delaware, died in San Francisco on Oct. 25, 2011, at the age of 80. Prof. Liu’s major scholarly contributions to history were his two valuable books in 17th century English history: Discord in Zion: the Puritan Divines and the Puritan Revolution, 1640-1660 (The Hague, 1973) and Puritan London. A Study of Religion and Society in the City Parishes (Newark, Del., 1986). In the former study, he charted the transformation of Puritanism from a reform movement concerned with religion to a political movement seeking the reconstruction of church and state, which then collapsed into self-defeating factions. In the second book, venturing into social history, Dr. Liu sought to determine the economic, social and religious conditions that favored the success of Puritanism in the parishes of London or, by way of contrast, the resilience of Anglicanism. Nuanced, thoughtful and scrupulously researched, this study argued that Puritanism most easily took root in a parish where Puritan preachers were able to cooperate with successful merchants and tradesmen. But that was not the whole story. Puritanism could also flourish in poor parishes, so long as effective ministers won the loyalties of their people. In the end, Prof. Liu warned against any rigid socio-economic interpretation of a complex movement. Dr. Liu also served as the editor-in-chief for a 13-volume edition of new studies in Chinese cultural history, for which he received the Golden Tripod Award from the government of the Republic of China (ROC). The young Chinese scholars with whom he collaborated on this project said that they profited from his knowledge of the West as well as his strong foundation in the Chinese classics. That foundation dated from his childhood, when his father, who valued the classics, saw to it that he became familiar with them as well. As a child, he practiced his calligraphy daily, using a stone tablet coated with a paste of the local yellow earth and wiping the tablet clean before starting all over again. With hundreds of his high school classmates, including his future wife, Wang Lintung, Dr. Liu fled Nanyang City, Henan Province, in central China in October 1948, in the midst of the Communist revolution. It took the group 10 months to complete a dangerous journey of about 1,000 miles, mostly on foot, and to reach what is today Vietnam and comparative safety. Not all survived. There followed five difficult years in camps for displaced persons, first in Vietnam and then on a small island in the Gulf of Thailand. The refugees suffered the effects of malnutrition; and, again, some died. The survivors built huts for shelter, planted vegetable gardens and even organized schools for children. Perhaps the low point came when French authorities decided to return them to the very China from which, with such difficulty, they had fled in pursuit of freedom. The refugees resorted to a Christmas hunger strike and obliged the government to relent. They made it to Taiwan in 1953, and Dr. Liu married Wang Lintung a year or two later. She has written an autobiographical account in Chinese of the escape from China. Prof. Liu earned the B.A. 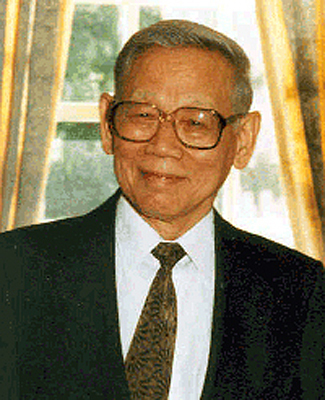 from National Taiwan University in 1957, where he studied English in the Department of Foreign Languages. He had begun some English instruction in Nanyang City and in the refugee camps had somehow memorized an English/Chinese dictionary that had miraculously survived the trek. As one of the first recipients of the ROCs Dr. Sun Yat-sen Scholarship in Western History, he next studied European and English history at Indiana University, where he received his Ph.D. in 1969. He taught for a year at Earlham College before coming to Delaware in 1967. In addition to English history, Prof. Liu offered courses in Western civilization and in Chinese history. An excellent teacher, Dr. Liu was known for his kindly, supportive manner with students and for his unfailing graciousness as a colleague. He retired in 1993, revered by all members of the department. It was not the least of his accomplishments that he mastered perfect idiomatic English, while retaining all his skills in his native language. When he died, Prof. Liu was translating Dante’s Divine Comedy into Chinese. In addition to his wife, Dr. Liu is survived by their three children: Lily of Washington, D.C.; John of Princeton, N.J.; and Jeffrey of San Francisco, as well as five grandchildren.